On Pinterest, I came across this great recipe for baking soda clay from the NewNew blog. This clay is very easy to cook up, cheap supplies, nice to touch and white! This dough is so much better than salt dough. Combine the ingredients in a non stick pot. Stir it on medium until it becomes thick like mashed potatoes. Once it reaches this consistency transfer it to a different bowl. Place a cover on it but don’t seal it completely. Let it cool. Once cool, you can create all different sorts of fun sculptures. We focused on pretend food making pretend cookies, cupcakes and candy. Some of the kids added seed beads to the clay for sprinkles (nice effect). 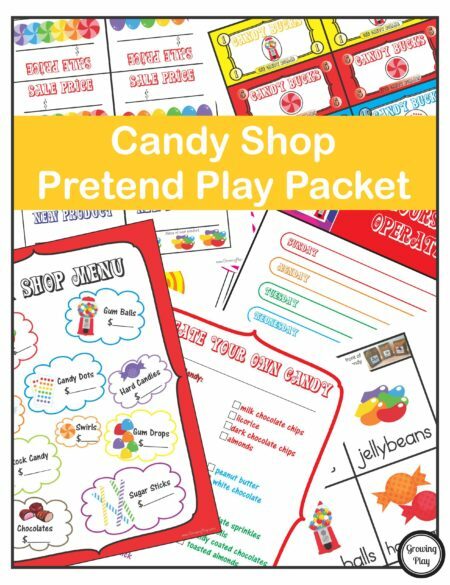 We wanted the pretend sweets to add to our pretend candy shop. We let them air dry for about 48 hours. Once dry we painted some but found that permanent markers worked really well on them. It gave vibrant colors and allowed for more detail. Don’t make anything too fat or it will take too long to dry. Don’t make anything too thin (less than 1/2″ diameter) or it breaks off easily. If you plan on playing with the items you create make sure they are of sufficient diameter or they will crumble or break.